WWII US Savings Bond Appreciation Plaque issued January, 1946 for volunteer service during WWII. Has statistics on reverse side. 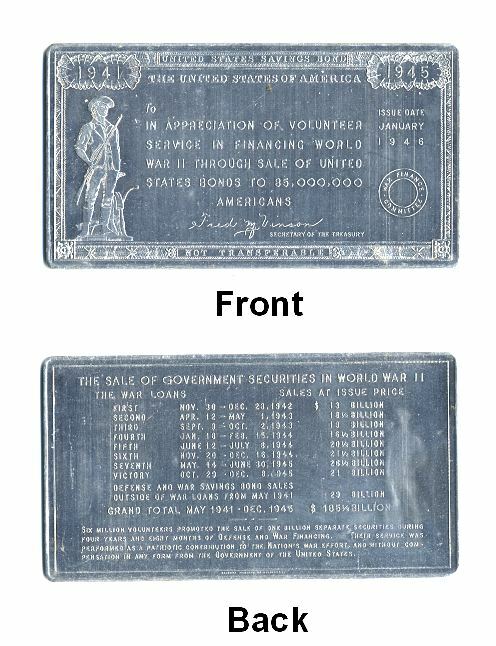 Aluminum material with an approximate size of 1-13/16" x 3-5/16"
In 1941, in an effort to control inflation, the U.S. Treasury began marketing the new Series E bonds U.S. Savings Bonds as "defense bonds". The government used the hype of the war to market the bonds to the country as a way to raise money for the war, when in fact they were used to remove money from the economy to control inflation. The first one was sold to President Franklin D. Roosevelt on May 1, 1941, by Secretary of the Treasury Henry Morgenthau. After the formal entry of the United States into the war in December of that year, these bonds became known as "war bonds". These bonds were simply the latest offering of the U.S. Savings Bonds program that had begun in 1935, which replaced U.S. Postal Savings Bonds, and continues to this day. However, the mood of the nation at that time allowed the U.S. government to market Series E bonds as "war bonds", "war loans", "victory bonds", and by other names meant to appeal to a sense of patriotism.